"Our collaborative research can provide the basis for future decisions on supporting farming and biodiversity in our uplands. A study carried out over a 10-year period by ecologists at the James Hutton Institute and the universities of Hull and Aberdeen has shown that grazing a mixture of sheep and cattle, at low intensity, is the best approach for maintaining biodiversity in the British uplands. The British uplands are internationally important for their unique plant and bird communities. Species such as meadow pipits (a common upland songbird), field voles and red foxes live in a delicate balance that can easily be disrupted by changes in farming practices. Although it is known that livestock grazing has a significant impact on the variety of plants and animals that are found in grassland areas, the relationship is complicated, with different species affected in different ways. For the first time, ecologists have conducted a long-term, landscape-scale experiment looking at the consequences of livestock management on multiple plant and animal groups that consume each other within an upland ‘food-web’. 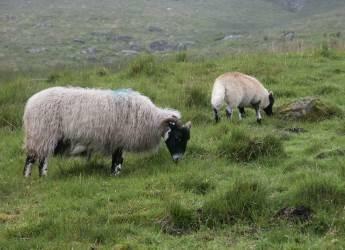 The aim of the research, which took place at the Glen Finglas estate in central Scotland, was not to determine a single approach to livestock grazing that would result in a ‘win-win’ situation for all species, but rather an approach that provided the best possible trade-off between ‘winners’ and losers’. The researchers established separate blocks of land that were each designed to mimic a range of livestock grazing scenarios. For ten years, between 2002 and 2012, measurements including plant diversity, insect abundance, meadow pipit territories and signs of vole and fox activity were recorded in each experimental plot. The study published today (30 March) in Ecosphere, concluded that grazing a mixture of sheep and cattle, at low intensity, was the best trade-off between benefiting the meadow pipits, and disadvantaging the voles and foxes; therefore maintaining the balance of biodiversity. Grazing both cattle and sheep, rather than sheep alone, is particularly important, as the different feeding habits of these two animals means that a whole range of different plants and plant parts are consumed. This prevents just a small number of plant species being grazed very hard, while others are allowed to grow freely. “This study supports some of our other research that shows that mixed livestock grazing systems also improve livestock productivity and reduce methane emissions,” Dr Evans said.